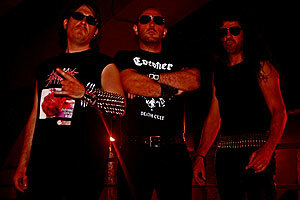 ALTAR OF SIN is a Spanish true Metal Massacre band from Valencia. They are making war since 2003 with Carlos Overkill on guitars and Goyo Hammerhead (past drummer of Voice of Hate and Profundis Tenebrarum) on drums, they also share the task of singins their hellish songs. ALTAR OF SIN is one of the few bands in this style where we can see a drummer singing like a possessed while mercilessly playing drums. After many changes of bass player, Javier Destruction was the definite bassist for the band since 2008. In that moment they released their first official release, theMCD “Praising Evil” through the Spanish label Hecatombe Records, which included their first MCD “Altar of Sin” (self-released at 2006) as bonus on the same CD, which received very good reviews from the extreme public, giving the listeners what they were looking for, a Thrash Metal in perfect consonance with Death Metal resulting in the most the most extreme Thrash Metal ever made in Spain. In 2010 came the continuation with the CD “The Damned Dogs from Hell”, also through Hecatombe Records, another whiplash without mercy for the listener, gathering a quality heavy sound with the runaway energy of these three Metal warmaniacs. Since the release of “Praising Evil”, ALTAR OF SIN have been spreading brutality all over Spain and sharing stage with some international acts such as Onslaught, Sadistic Intent or Malevolent Creation. Now comes “Tales of Carnage First Class” recorded at September 2011 at Fireworks Studios (Valencia) with cover artwork by Namtaru Creations, undoubtedly the best work by the band where they blend quality with the wildest savagery... For this work, the band has signed a deal with Xtreem Music for its release in early 2012, which will mean another step forward for the band in their aim to expand the infernal hybrid of Thrash/ Death.